I am sure alot of us don’t understand and don’t even want to understand taxes. However having a basic understanding of the subject will help save some extra money to buy that Playstation 3 you always wanted. For most of us, the taxes are paid on our behalf through our employers. Employers automatically withhold taxes from our gross earnings before giving us our net earnings. Your employer is also responsible for reporting your total income and taxes paid by submitting form W-2 to the IRS. You must then file your taxes-which tells you the total amount of taxes owed and the total amount of taxes already paid-and either pay the difference (if your automatic deductions were too small) or collect the difference (if your automatic deductions were too big). Use of personal finance software to enter and maintain accurate records. Get receipts for charitable contributions. Maintain accurate records of the purchasing and selling of stock as well as stock options. Read and understand about 401(k) retirement plan. Doing so will let you defer the taxes you pay on your contributions and will allow your contributions to increase through compound interest. Consider tax-efficient investments such as tax-free municipal bonds or tax-efficient mutual funds . I also wanted to point out few of the important taxes everyone should know. Capital Gains Tax: Capital gains tax represents the tax paid on the increase in value made on an investment. So if you make profits from trading stocks, you need to pay taxes on it too. Corporate Tax: The tax paid on the profits made by the firm. 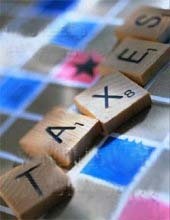 Income Tax: The basic direct tax on any income, this includes capital gains, wages, etc. Property Tax: A tax on any property owned by the local government. The tax is usually based on the value of property (including the land) you own. Payroll Tax: Tax an employer withholds and/or pays on behalf of their employees based on the wage or salary of the employee. FICA Tax: A deduction from paychecks and income that goes toward the Social Security program and Medicare. Both employees and employers are responsible for sharing the FICA payments. The act stipulates that there is a maximum that can be allocated to Social Security, while there is no maximum on what can go toward Medicare. The amount of the FICA payment depends on the income of the contributor, so the higher the income, the higher the FICA payment. (For example: 12.4% of your income goes toward Social Security and 2.9% goes toward Medicare, and you earn a salary at your company, half of the payment is made by you and the other half by your employer. This means you pay 7.45% (6.2% and 1.45%) of your income, while your employer pays the other 7.45%.